The Receipt Card System is a patent pending concept for the retail and business customer that would ultimately eliminate the need to retain paper receipts for purchases, store returns, expenditure tracking, and rebate/warranty processing. Very similar to a loyalty card, the receipt card system may be a key-chain tag or credit card size product that would contain a personal identifier to the customer via a barcode, magnetic strip, or other technology. The customer may also assign a secret code or password if the physical receipt card were not present at point of purchase. The receipt card may also be linked up to a user?s major credit or debit card whereby all transactions made on the credit/debit card would also link into the receipt card database. Upon checkout of a store, the customer would be able (at participating stores) to scan or swipe their receipt card which would electronically upload all purchase receipt information to a personal database. The personal database would be managed by one or more Information Technology Providers (ITP?s). ITP?s may be but are not limited to Software Application Companies, Electronic Commerce Solution Providers, Point of Sale (POS) Solution Providers, Internet Information (Search & Advertising) Engines, and Consumer Credit Card Providers. 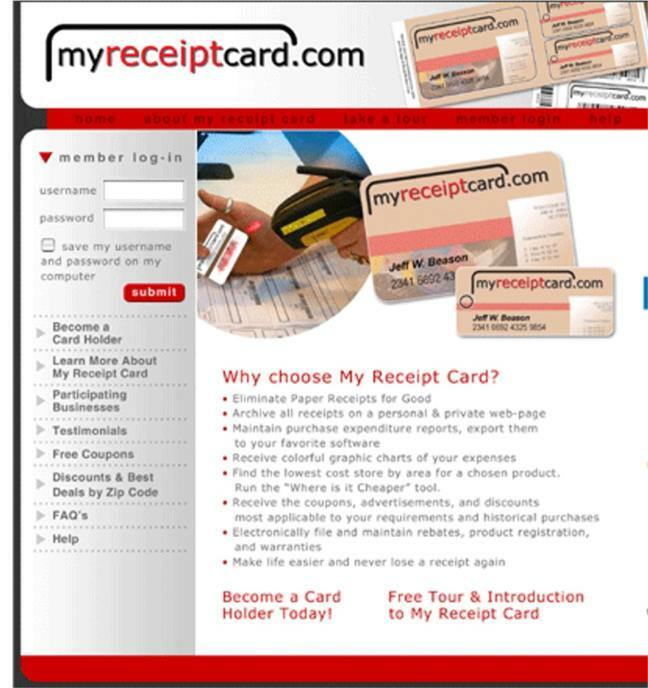 The customer, upon completion of shopping activities, would then be able to login to their myreceiptcard.com (or similar) personal and private web account to access their archived receipts. In addition to accessing and printing receipts, the website may also enable the customer to maintain a personal database of expenses, run purchase reports, create purchase, graphs/charts, access/receive coupons, submit warranty and rebates, perform cost modeling, and find competing local stores offering lower prices on like items. Inventor is searching for an Information Technology Provider who is able to see the vision and long term value of this new innovative concept. The ultimate ITP will have the infrastructure and network of applicable industries to enable this creation from concept phase to beta test and long term global implementation phase. Upon successful implementation, the ITP will be providing millions (if not 100?s of millions) of consumers with a golden ticket enabling permanent receipt storage, financial tracking/reporting, and many other novel features not available to today?s consumer. The benefits will be much larger to the ITP than just targeting the consumer segment. The enormous wealth of data provided by consumer spending will enable the ITP to offer macro and micro-economic data to manufacturers, distributors, marketing/promotion companies, retailers, and other important companies involved in the chain. In addition, the ITP will be able to finitely target advertising campaigns and web page banner placement that reach out to the entire supply chain or a finite link within. 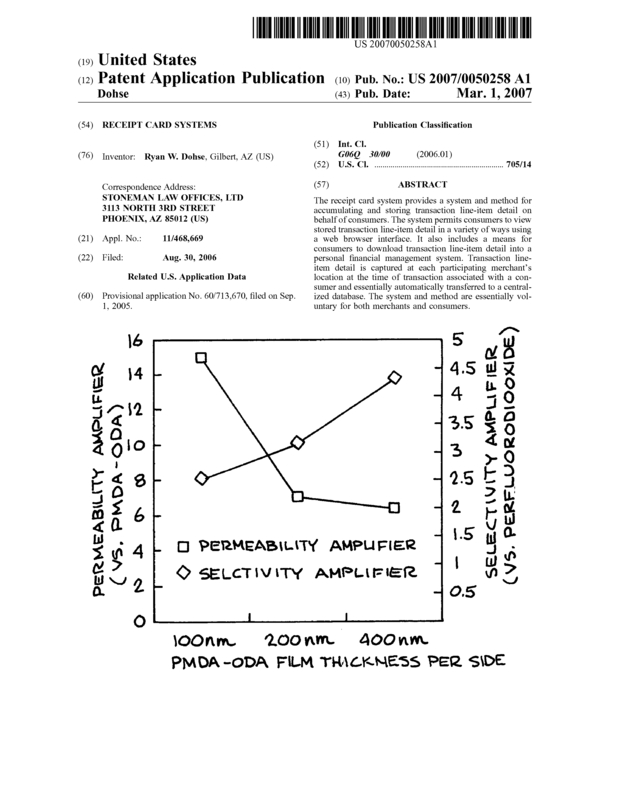 Inventor is seeking to license or assign the long-term rights of this intellectual property to an ITP with a technology and business roadmap that is capable of enabling this concept. Inventor has created a conceptual website for The Receipt Card System. This website, located at link below, will provide our vision of how the consumer as well as the manufacturing, retailing, and other key supply chain elements will benefit and use this information technology and solution. Our vision is to one day use a receipt card as consumers and business owners, we will rely on your company to help make that happen. Page created at 2019-04-21 19:00:55, Patent Auction Time.